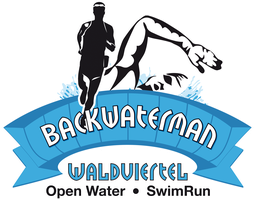 SwimRun Competitions - backwatermans Webseite! In order to practice or test the new sport with different performance levels, we are offering 3 distances in the unique landscape of the Ottenstein reservoirs. Two dam walls allowed the flooding of a valley into any branching, forming a fjord-like landscape with perfect SwimRun options. The focal point is the Ottenstein Castle, which offers a unique panorama of start and finish as well as registration, award ceremony, race briefing and banquet in a medieval castle. Through the organization in 3 different rounds, which come at a hotspot 3 times also for the spectators and / or attendants a repeated meeting and kindling becomes possible. Unique is the possibility to complete all tracks on the original marathon route with no overlaps.. While the Marathon starters complete the first part around the Dobra Reservoir with another castle and ruin at the lower reservoir, half marathon and trial start just before the arrival of the first long runner. On the second trial part around the arena there will be the first overhauls and encounters, which can additionally motivate all starters. While the trial starters turn back to the castle at the first hotspot, the half marathon and marathon starter go together for the long lap towards Zwettl and cross several times the backwater man's legendary open water course.